The answer to this seemingly straightforward question is complicated to say the least. Think of asking 10 people what their favorite color is. You will probably get 10 different answers. Let’s start with explaining what will likely happen if you don’t get enough protein in your diet to just maintain your current weight. Slower Recovery from exercise – protein helps repair muscles. Yes, even when taking Glutamine Select. Muscle Atrophy – you’ll begin to lose muscle without the building blocks that protein provides. Once you have muscle, you don’t want to lose it! Food Cravings – protein keeps you satiated, much more than carbs which are prevalent in most Americans’ diets. Less Energy – protein fuels your body. Without it, you’ll tire and fatigue easily and quickly. To sustain life you need about 36 grams of protein per 100 lbs. of body weight. Beyond that, those “in the know” can’t agree on how much protein is needed to gain lean muscle. Most say somewhere between 0.8 and 2 grams of protein per pound of body weight depending on your activity level and your goals. However, some focus on the amount of protein per pound of lean body weight instead of total body weight; others talk about types of protein; and still others quantify their answer by identifying certain times to consume a specific amount such as immediately following strength training. My philosophy on calculating how much protein is to keep it simple, especially as you learn about bodybuilding and overall fitness. You should aim to consume 1.5 grams of protein for every pound of your body weight. If you weigh 200 pounds, you should have 300 grams of protein daily. Supplement bars and shakes are easy to eat/drink and are portable, but most of your protein consumption should come from real food. Spread your protein intake throughout the day. If you are eating 6 meals a day, each one should include about 50 grams of protein. 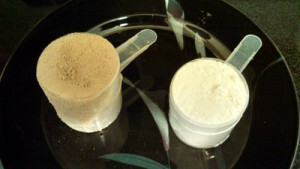 Focus on two types of protein – whey and casein. Whey is absorbed quickly into your bloodstream while casein is absorbed at a much slower rate. Drink or eat whey immediately before or after your workout. Enjoy casein at bedtime. Many studies have shown that when someone uses both types of protein, muscle growth will result. Keep in mind that eating in excess of your maintenance calories must be coupled with more challenging workouts if you want to build muscle and not only gain fat. As you exercise regularly and keep your protein intake at about 1.5 grams per pound of body weight, you will see the positive changes that you are working to achieve. You might want to try a little less or a little more protein and see how it affects you. If you aren’t comfortable doing this alone, contact a certified personal trainer and nutrition coach to assist you in creating a workout program and meals to help you meet your goals. Contact me to to make sure you are choosing the right protein at the right time, and to learn how to buy it at lower than typical retail prices.